Here’s a picture of a fake “Order Confirmation” email I received recently. How many clues can you spot that indicate something is not quite right? How many fraud indicators did you find? 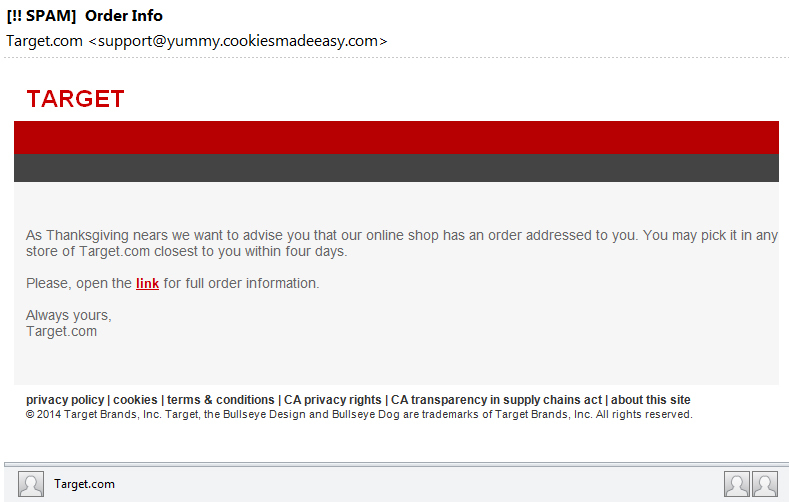 The “From” information: support@yummy.cookiesmadeeasy.com is not a Target email address. The logo is wrong. No bullseye anywhere. “As Thanksgiving nears…” Thanksgiving was a couple weeks ago. Wrong holiday, dummies. The (attempted) conversational tone of the email: if you had an actual order to pick up, the email would begin with this information. Whichever holiday is approaching is absolutely irrelevant (for the store) to the fact that they’ve got merchandise they want you to pick up as soon as possible. The excruciatingly bad grammar. Go ahead, read it out loud. It’s beyond horrid. This isn’t even how in-store pickup orders work…the customer chooses which store to have their purchase shipped to, and that’s where it goes. That’s the only place it goes. You don’t just go to any random location because they don’t ship one to every single store when an order comes in. And what happens if I don’t “pick it” within four days? Again, not how online orders work. When you get a real order confirmation email, the order information is almost always included in the message. You don’t have to click a link to get to it. Speaking of links: makingteamsrock.com? Not a Target website. “Always yours, Target.com.” Pretty sure they don’t refer to themselves as “Target.com.” Or use “Always yours” as a closing. So, I found thirteen. Did you catch any that I didn’t?